Extreame Savings Item! Save 43% on the FAMILIFE F03 Manicure Pedicure Set Nail Clippers Tool 13pcs Professional Stainless Steel Portable Travel Grooming Kit Nail Care Nail Scissors Kit Men Women by FAMILIFE at Beauty Sols. MPN: L0558. Hurry! Limited time offer. Offer valid only while supplies last. Professionally Tailored Manicure Set 1. Ergonomic design,curved knife edge fit nails. more comfortable. 2. Non-slip design, not easy to fall off. 3. Heavy duty manicure set is a perfect gift for yourself, families and friends, for health. 【Stainless Steel Manicure Set】FAMILIFE nail clipper set tool are made with stainless steel, allow safe sterilization and prevent corrosion. never rust. It comes with a portable zipper case, is made of fabric and PU leather, this heavy duty nail grooming kit is a great gift for your family and friends. 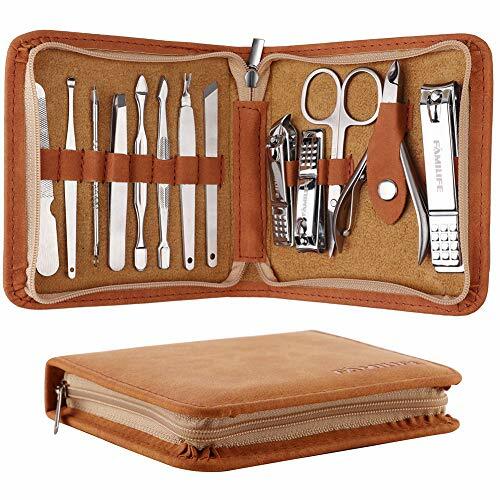 【Portable and Lightweight】The FAMILIFE 13 Piece manicure pedicure nail kit comes with a brown portable PU leather case, the case mini size is 4.5 * 4.8 inch, the compactly designed size of the leather case makes it highly convenient to carry as it takes minimal of storage space. can fit into almost any handbags or shoulder bags, you can carry it in your bag everyday or when you travel. 【Warranty】All products of FAMILIFE BRAND are protected by FAMILIFE, FAMILIFE is a leading factory which has specialized in many kind of beauty tools for more than ten years, so FAMILIFE can offer you best service 100% Satisfaction Guarantee, we will either refund your money or redeliver a new product if you are not satisfied with manicure pedicure set for any reason. If you have any questions about this product by FAMILIFE, contact us by completing and submitting the form below. If you are looking for a specif part number, please include it with your message.